Our guest this week for Why You Should Read… is none other than the illustrious John Ottinger III, the chap behind Grasping For The Wind. 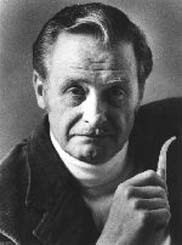 He can also be found on Twitter as @johnottinger — and his subject today is David Eddings, one of the most beloved fantasy author icons. David Eddings is my all-time favorite author. As one of the first authors of fantasy I ever read, his work has a nostalgic quality for me. It’s a reminder of those days in middle school when I could spend an entire day reading (I was homeschooled) and finish one of his 600+ page novels in one sitting. Eddings (who wrote most of his work in conjunction with his wife Leigh) also made reading fun, using wry humor and silly yet fond interpersonal relationships to turn his epic quests into delightful romps. He also built big, huge worlds that were always imperiled and required unusual casts of characters to save it. His party quest stories were unabashed copies of Tolkien’s, yet where Tolkien was dark or morbid, Eddings was lighthearted and funny. He also built interesting histories for two of his characters, Polgara and Belgarath, that were as high-quality as the epic quest novels of the Belgariad and the Mallorean. Sadly, many younger readers are only familiar with THE DREAMERS series of his novels, which are really poor showings compared to his grand fantasies of the 1980s and 90s. 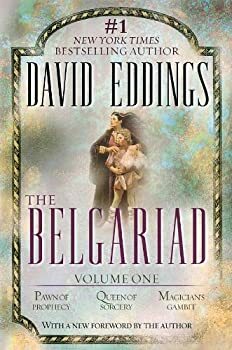 THE BELGARIAD/MALLOREAN and ELENIUM/TAMULI series were masterworks of formulaic fiction in the time when large epic fantasies were the norm, and everyone was emulating that style. Science fiction had gone by the wayside in favor of the Tolkienesque tales of Jordan, Goodkind, Hobb, Brooks, and Martin. Eddings was one of these elite epic fantasists, a regular bestseller on many lists, yet he never received an award for his work. Perhaps his work was too escapist, too focused on enjoyment rather than being literary to garner any significant awards (though he was nominated for the Mythopoeic Fantasy Award for Adult Literature for Queen of Prophecy. This was in part because he came to successful writing rather late. Graeme Neill (in an obituary) quotes Eddings as saying “’I’m never going to be in danger of getting a Nobel Prize for literature, I’m a storyteller, not a prophet. I’m just interested in a good story.” How could you not want to read a book by a guy who just wants to entertain you? Not create a new genre, not try to be “literary” or “push boundaries” — just tell a good story? This was something he did well, and his commercial success reflects that, even if he garnered no significant awards from his peers. For Eddings, fiction was fun, and his writing reflects it. He did churn out a couple of contemporary serious novels, The Losers and High Hunt, and the psychological thriller Regina’s Song (which would actually be classified as “paranormal fantasy” these days) but the majority of his work was congenial, entertaining epic fantasy. A good place to start is The Redemption of Althalus, a stand-alone novel (with two different covers) that encapsulates all of the goodness of Eddings, without the large series commitment. But if you are willing to be sucked in, the best novel to read is Pawn of Prophecy, the first book of the BELGARIAD, and the opening up of a complete series of exciting novels full of “Good vs. Evil, Nice Guys vs. Nasty Guys (or Them vs. Us). It has the usual Quest, the Magic (or Holy) Thingamajig, the Mighty Sorcerer, the Innocent Hero, and the Not Quite So Innocent Heroine — along with a widely varied group of Mighty Warriors with assorted character faults. It wanders around for five books until it finally climaxes with the traditional duel between “Our Hero” and the “Bad Guy.”(Would it spoil anything for you if I tell you that our side wins? )” (from the preface to the 2002 trade paperback edition). When an author winks at you conspiratorially, puts his arm on your shoulder companionably and treats you like you are both in on some grand joke, how could you not want to enter into any story he might have cooked up? Sadly, Eddings died in 2007 at the age of 77 with a manuscript left unfinished. I hope, one day, someone with the same tone, the same fun yet thorough writing style might pick it up and finish it for all the fans out there. So why is it that you should read the work of David Eddings? Because he makes you love reading. Like going to an all-action flick or standardized romance movie, you go to David Eddings because in his worlds you can just relax into the narrative, knowing that you will leave satisfied and with a grin from ear to ear. Can anyone suggest any fantasy writers with the same Humour and Style as Eddings? Please do not say Terry Pratchet. Silk is still one of my all-time favorite characters. Great stories. I looooved David Eddings when I was younger. I kind of pulled away as I got older, though I think the Belgariad still holds up as a wonderful series. I felt the Elenium was trying too hard to follow the formula he set up in his first two series’ and couldn’t enjoy it for that reason. It just felt derivative. @Mark– I think Brandon Sanderson comes closest to feeling like Eddings among modern authors. I do think Sanderson is more imaginative, but I think they have a similar likability. I first discovered Eddings through the Elenium. I read the Tamuli when it came out, but didn’t read the Belgariad or Malloreon until relatively recently (in the past 5 – 8 years). At the time, the Elenium series was a great friend. Literally, the author, the story and the characters involved felt like great friends that meant a lot at the time. John’s post articulates, rather well, the experience one may encounter in reading some of Eddings works. John- I’ve never read Eddings but your article does make him appealing. That last paragraph perfectly encapsulates why I love reading David Eddings! That and the fact that the books never fail to leave me chuckling out loud. Reading Eddings makes me feel like a child again, experiencing the wonder of a well told story. Reading Eddings make me feel like a child again, experiencing the wonder of a well told story. The Belgariad is epic, when I start reading I cant put it down. A wonderful and genuinely warm article about one of my still most treasured authors. Their books will always have a place in my heart as The Belgariad was the first multi-book saga I finished, probably at the age of 10 or 11 and are a treasure trove of fondly remembered characters (Silk!) and moments (Garion sinking into the mud whilst trying to push a rock with his will and being teased afterwards never fails to make me laugh out loud) that have stuck with me for 20 years and always will. I’m also fond of the The Elenium, as it gave me a taste early on for more politically orientated and darker fantasy and whilst it shares some common themes, I disagree with those that claim it’s just another carbon copy of Belgariad / Mallorean. RIP David and Leigh and thank you for bringing us such warm, funny and engaging stories. hey ya’ll! would you mind if I reposted this on my own site? 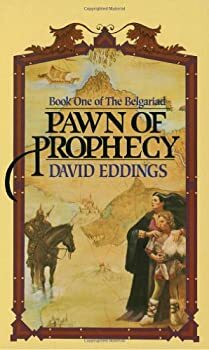 I first came to David Eddings in my early twenties and found it a great relief after the heaviness of Lord of the Rings. I still love him now even though I am over 50 and I have just loaned my treasured copies to the 10 year old daughter of a friend – I find it amusing that we can spend ages discussing his books without really feeling the age gap ! I too read these when they first came out and I was young. Like many of you Silk was a favorite of mine as well. And I also loved Sparhawk from the Elenium. I loved that he called people “Neighbor”, instead of “Friend” because he might have to kill them. My goodness…this guy went to jail in 1970 on a child abuse charge. Him and his wife kept their 4 year old son in a cage in their basement and she was whipping him with a leather strap when the sheriff intervened. He didn’t leave that “small teachers college” (BHSU in Spearfish South Dakota) because he “didn’t get a raise”..he left it because he got fired after sitting in jail for a year. I certainly hope they made ammends in their post abuse life. I was given The Belgariad in 1988 and went through the whole ten books in quick time. I was 30 years old then. I’ve just turned 60 and I now have the whole sets of them in my Kindle. It’s like Eddings constructed a magical word in my head. There’s a door there and, when I’m down or whatever, I can open that door, walk through it and meet my friends again in a world so familiar to me now. Perhaps, one day, I will, in my dotage, walk through it one last time and the door back will have magically disappeared. I may be worried that I can’t get back….. but I doubt it.